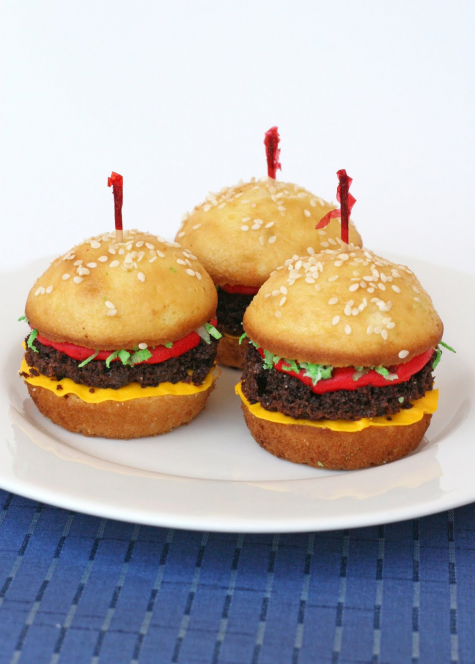 Just in case you didn’t read the title of this post, these are not hamburgers, they’re cupcakes! I hesitated posting these treats due to the fact that I know they have “been done before”. I first gave this idea a try last spring (HERE), and have made them a couple times since. So, I’m certainly not suggesting I came up with this idea… but it’s just so cute, if you haven’t given it a try, it’s really fun to do and will surely bring lots of smiles to anyone you share it with. This is a perfect project for kids (to help), and with Father’s Day this weekend, this could be a fun treat to show some love to daddy. I sometimes just use box mixes for this project, since it’s more of a novelty than a gourmet dessert. I bake the cupcakes without any paper liners (just use some non-stick spray on the pan). Baking the cupcakes without the liners allows the outside edges of the (vanilla) cupcakes to brown a bit. To me, this looks the most like hamburger buns. You can use paper liners if you prefer, but then the sides of your cupcakes will have little ridges (from the creases in the paper liners). When the cupcakes are baked and cooled, slice the vanilla cupcakes in half (horizontally) and slice the chocolate cupcakes in half or thirds (horizontally), depending on how big you want your “hamburgers”. Set these “buns” and “meat” aside. Put about 3/4 cup of (sweetened) shredded coconut in a plastic baggie and add 1 or two drops of green liquid or gel food coloring. Close the plastic bag and shake the bag until the coloring is well distributed. You can use a tub of store-bought frosting, or make your own vanilla frosting (you can use my recipe for cream cheese frosting as is or omit the cream cheese for a super simple American buttercream). Color half of the frosting red and half yellow (you may want to add a touch of orange to get a nice mustard color). 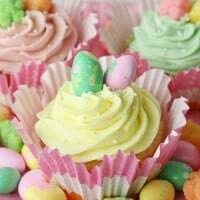 Place each color of frosting in a piping bag fitted with a (medium sized) round tip, or simply put the frosting in a strong ziplock type bag (the freezer bags are usually a stronger bag) and cut off one of the corners of the bag (start small, you can always make the hole larger). Start with the bottom half of a vanilla cupcake. Pipe a line of “mustard” frosting around the edge. Add a slice of chocolate cupcake (the “meat”). Pipe a line of “ketchup” around the edge. Top with a vanilla cupcake top. For a final touch, you can brush the tops of the “hamburgers” with a bit of juice or simple syrup (I usually use orange juice) and add some sesame seeds. You can also add a frilly toothpick. To complete your “meal”, make some sugar cookie “fries”. Make a batch of sugar cookie dough (my recipe HERE). Chill, and then roll out the dough as directed. Cut the dough into strips using a pizza cutter or knife. The strips can be as fat or thin as you want depending on how you want your “fries” to look. Lay the “fries” onto a cookie sheet and set the whole sheet in the freezer for a few minutes (about 5) to chill the dough (this helps the cookies keep their shape when baked). Once baked, cool just enough to remove from the baking sheet. While still a bit warm, place cookie “fries” in a shallow baking dish and sprinkle with white sugar (to represent salt). These cookie “fries” can be made several days in advance (up to a week) and kept in an airtight container. 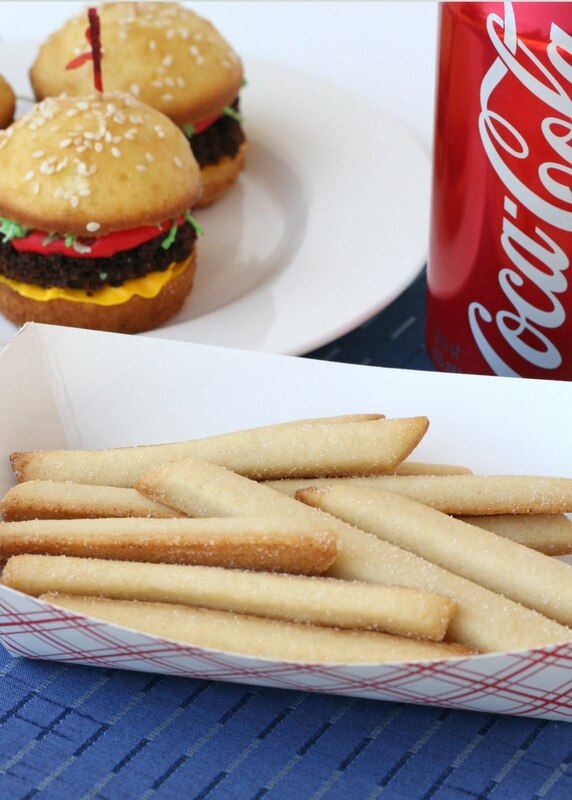 Serve the cookie “fries” along side a cupcake “hamburger” and you’re sure to make your family and friends smile! Seriously too cute!!! Love this! This looks so fun. Now I am hungury for hamburgers and cupcakes. These are so awesome! I especially love the fries! This is such a precious idea! How adorable!!! My grand-daughter wants me to make her cupcakes for her 7th birthday party. This just might be the ones I make, they are adorable! Thanks for the post. oh wow such a great idea, love the novelty of it!! hehe. These are great! 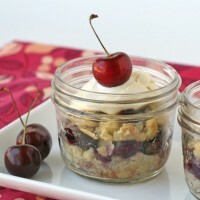 I am going to attempt to make them for my hubby today! Thanks for the recipe and idea! I love these! They really do look like little sliders with a side of fries Love your blog…and cookie cutter collection! I just came across your blog and it is adorable, very cute. oh WOW!!! 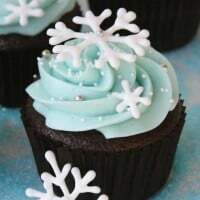 what an amazing cupcake! I LOVE your site! I LOVE this absolutely believable combo of burgers and fries. SO cute! 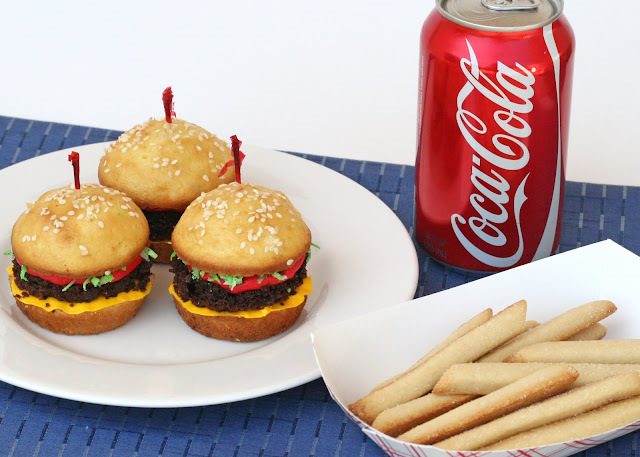 The fries look so real, at first I thought they were actual french fries and wondered why they would go with cupcakes. Fabulous idea! Wow, Glory, this idea REALLY blows me away! I've got to make this for Stephen and the kids. genius – these are gorgeous! I like to use brownies as the hamburger. And pound cakes make excellent french fries if you cut them with a serrated knive. On Bakerella's site, there are templates for the checked hamburger holders like you get at a Dairy Queen. Tre cute. Thank you for posting these cupcakes. I just made them for Father's day and they are so adorable! I made these today and LOVED doing it. They came out so cute. Thanks for the tutorial. Had a lot of fun making these tonight! Took a while, but got there in the end. Added a bit of baked custard to look like a cheese slice. Made these for my twins 13th birthday party last weekend. They were a huge hit! I made these tonight for a cupcake party they are so cute. What is the best way to store them for a day or so? These will be perfect for my son's April Fools Day birthday this weekend! These are really adorable, and thansk so much for posting! As a flavor variation, extracts can be added to the icings – peppermint to the green icing, or cinnamon to the red, or lemon to the yellow – obviously not all on the same “burger”! lol Another reader posted that starburst candies can be warmed quickly in the microwave, then too pieces of the same color can be “flattened together” and shaped into the “cheese, lettuce, or tomato”, I also wonder about using melted gummy bears, but haven’t tried them. One other variation of this burger theme is also to make “sanwiches” with Vanilla wafer cookies and small peppermit pattie candies. Same idea, make the “sandwich”, then microwave for a few seconds so they stick together. Garnish with icing as suggested with the cupcake version. 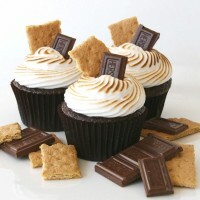 When I first saw these the idea that they were cupcakes and cookies never crossed my mind! Plans to make these for my son’s 6th birthday. He loves spongebob, so this will be the krabby patties. Making them today! Look delish! These are GREAT! My daughter is seriously anti-mustard—I piped the yellow into a square to look like a cheese slice, the square corner “melted” off the edge. 2. I didn’t have time to make sugar cookies so I bought store-made pound cake and used a wavy knife (pampered chef) to cut into thick cut fries. I greased a cookie sheet and baked the “fries” at 250 for 10 minutes and then flipped and baked for another 2 to allow all sides to brown up. I added a side of frosting ketchup to complete and everyone loved these. This looks awesome! Looking forward to try it!